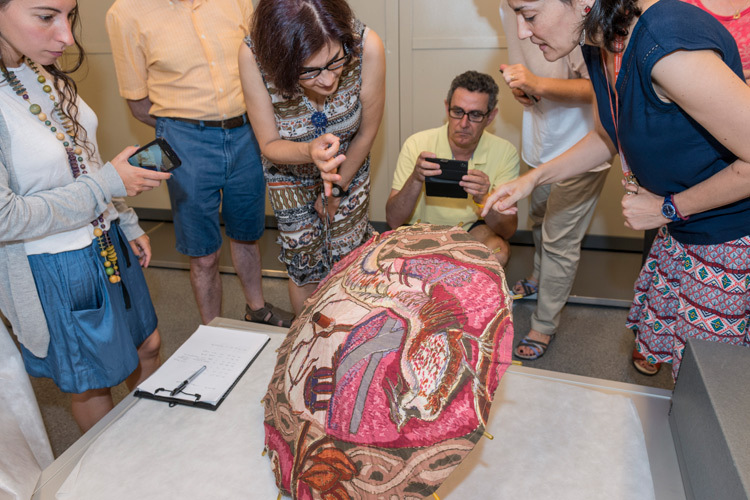 The CDMT organizes an increasing number of free, informative activities for adults, based around the content of its temporary exhibitions: guided tours, talks by experts, and workshops on specific materials and topics related to the history of textiles and clothing. Visitors can also take part in the exclusive Experience for yourself… activities, a new and immersive way to enjoy the museum in which members of the public are invited to become part of the CDMT team and learn about the collection first-hand. No two Experience for yourself… activities are the same, as they are based around the themes and materials the CDMT is working with at any given time, but they all follow a similar structure: participants get to know the inner workings of the Centre, seeing what goes on and how it is done, experiencing it for themselves! Places are extremely limited, as the groups will be using areas of the Centre reserved for technical work. Small group numbers also make for a more interactive experience between participants and the CDMT staff. At the end of the two-hour activity, the group and staff members enjoy a drink together and discuss the surprises that have come out of the experience. Check for scheduled activities in our Calendar.